Want to take control over your WordPress site or maybe just start one? Want to share your writing, photography, ideas, recipes or something else with the world but don’t know how? 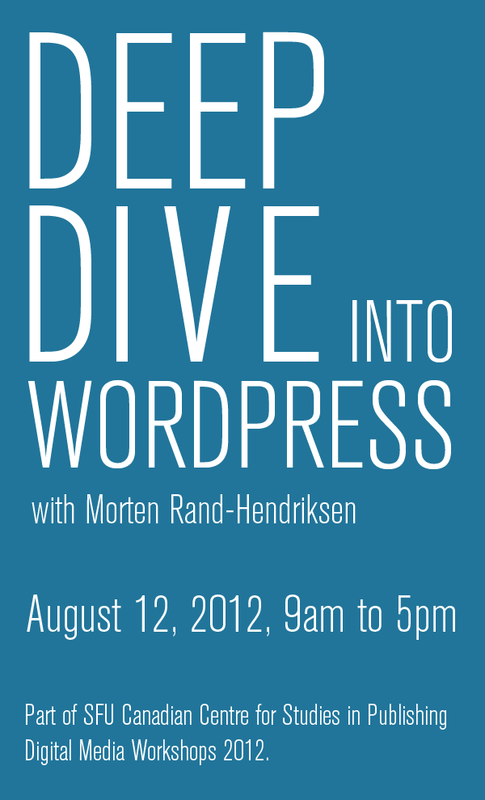 Deep Dive into WordPress – a one day intensive I’m hosting at SFU on August 12, 2012 is designed to give WordPress virgins a solid footing and those already familiar with the application new insights into what the application can do to make you and your content more visible on the web. Follow this link to reserve your seat! The Canadian Centre for Studies in Publishing is hosting a series of Digital Media Workshops over the summer and they approached me to create one on WordPress. I am hard at work refining the program which will be a primer touching on all important aspects of the application, from setup, security and SEO, to how to create and publish better content and integrate your site with social networks to get the word out. If you have a WordPress site or want to have one, this is the class you need to take.